Our Elephant Trunk option is an efficient way to get concrete to where you need it. For infrequent use, we recommend our economical PVC elephant trunk – “ETP” series. This comes in 50′ rolls. Our “ETR” series elephant trunk, made of pure gum rubber, has the durability you want for continuous use. Rubber elephant trunks can be supplied cut to any length – up to 25′. Specify length at time of order. 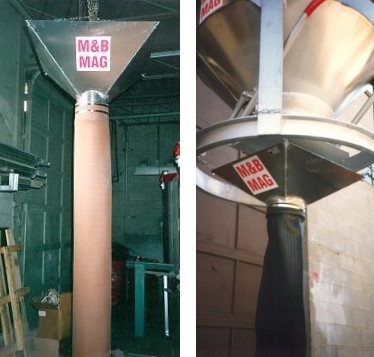 Typically an elephant trunk is attached to a Sub Hopper directly with two stainless steel clamps. For a quick disconnect use an elephant trunk attached to a Tapered Collar.